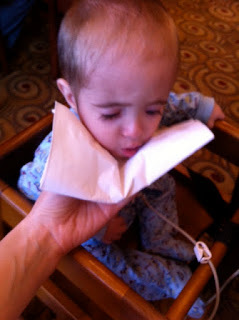 A toddler that seems a bit down and reluctant to eat even those foods that he normally loves eating is not a good sign. It is an indication that he is about to vomit. This toddler vomiting will not stop quickly and he will continue to throw up for up to three hours with 10 minutes breaks in between. The toddler will then become exhausted with all the throwing up and finally lay down breathing heavily. The following are some tips that can help you in getting out of this worrisome situation. Vomiting is a scary yet common issue faced by toddlers. There can be many reasons why a toddler might vomit, but more often than not it is nothing to worry about. However, finding out the cause for the vomiting is still vitally important so that the child can be given adequate care. If the child only vomits for a single time, then there is every chance that the vomit was only because of overeating; however, if it doesn’t stop, then one of the following reasons might be causing it. The vomiting might be because of a viral or bacterial infection. In toddlers, stomach flu is the most common reason for vomiting. However, in cases if the infection has affected the child’s stomach lining, he might have diarrhea and fever too. The vomiting in such cases might take about 24 hours to subside. Respiratory, ear and urinary tract infections can sometimes also cause vomiting in toddlers. In rare cases, vomiting can also be an early sign of pneumonia and appendicitis as well. Excessive crying, eating a toxic or poisonous substance and motion sickness are some of the other notable reasons that might cause vomiting in toddlers. What Can I Do to Ease Toddler Vomiting? The severity of toddler vomiting usually determines what must be done to ease the toddler’s pain and discomforts. If the vomiting is occurring in excess of 8 times during the duration of a day, then it would be considered severe and you must start worrying about your baby getting dehydrated. In case of mild vomiting (1-2 times per day) chances of dehydration happening are slim. However, in cases of moderate (3-7 times per day) and severe (over 8 times per day) vomiting, chances of dehydration become more pronounced. To save your child from dehydration, you must give him 1 floz (30mL) of either ORS, broth or gelatin dessert every 20 minutes for at least an hour. Start with small sips and if the child does not vomit again, increase the dose of the clear liquid by 1 floz for each hour he does not vomit. Avoid giving juices, soda pop or water to your child for rehydration purposes as they do not contain minerals and calories that the child requires at this stage. If your infant goes 8 hours after vomiting, you should start him on bland food like cereal as you can slowly get your child back to his routine diet. If your toddler is on formula milk, you should give him a couple of ounces less per feeding initially before resuming the normal diet after 24 hours since the last vomit. For slightly older babies, you can give them foods like mashed potatoes, bread, crackers, bland soup and cereal. In case of no further vomiting after you give your child bland food for a day or so, you can conveniently put your child back on his normal and routine daily diet. It is important that your child rests a lot after vomiting. You shouldn’t allow your toddler to go to school (if he goes to one) for two days after his last vomit. Resting for your toddler can help in settling his stomach as the stomach tends to be empty as the child sleeps into the intestines. The chances of food coming back through the mouth as vomit decrease enormously once it leaves the stomach. Vomiting can’t cause dehydration if the vomiting isn’t caused due to diarrhea. However, a lot of people give the entire amount of fluid they want after vomiting in one go which is one of the major reasons for continuous vomiting in toddlers rather than to slowly increase the amount of fluid the child takes. With no apparent drug available for vomiting, altering the diet is the only possible treatment. 1. When Do I Need to Call My Caregiver? You shouldn’t hesitate in contacting your child’s caregiver if you feel concerned about your baby’s overall health or if you have specific concerns about your child’s current condition. You should also give your caregiver a call in case the toddler vomits forcefully after you have fed him or in case the baby keeps on vomiting the fluids you give him. It’s also best to contact the caregiver if your child contracts high fever which doesn’t go away. 2. When Should I Call for Immediate Care? You should look out for help instantly or even call 911 in case your baby starts to gasp for air and suffers shortness of breath or if your child goes to sleep and doesn’t wake up even after multiple tries. Your child would need immediate help if his vomit has blood or has something similar to the looks of coffee grounds, or if he complains about abdominal pain persisting even after he vomits. You should also look for immediate care if your child gets extremely irritable and complains of severe headache as well as a stiff neck, or if he faces problems in urinating and cries when doing so.